The star of this book is the kind of dog who is so devoted he would follow his person to the ends of the earth. This story is the sequel to A Dog’s Purpose, in which this dog had many lives caring for his boy, Ethan. When he is Buddy in his later years of life, he meets Ethan’s granddaughter, a sweet girl named Clarity whom he protects around the Farm. When he passes and is reborn, he finds Clarity again and works hard to find and be with her each reincarnation. This dog is her constant companion and guardian for her whole life. I really enjoyed this book because it was very well-written with so much amazing detail. It’s interesting to read because it is written from the dog’s point of view and helped me see the story in a new perspective. This book is great for laughs and is heartbreaking every time the dog dies. It shows how incredibly loving, caring, and loyal dogs are to their people. 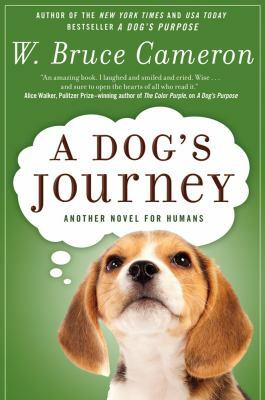 A Dog’s Journey by W. Bruce Campbell is available for checkout from the Mission Viejo Library. This entry was posted in Uncategorized by kotlcbooklover. Bookmark the permalink. Aw, this book sounds so cute! I’ve always loved animals, and I’ve been meaning to check out A Dog’s Purpose ever since the movie came out. I’ll have to add this book to my list of things to read, too, I suppose!